Reasons for concern: This deep-rooted aggressive plant can quickly take over both disturbed and unattended areas, outcompeting native species, reducing plant diversity and wildlife habitat, and forming huge monocultures. 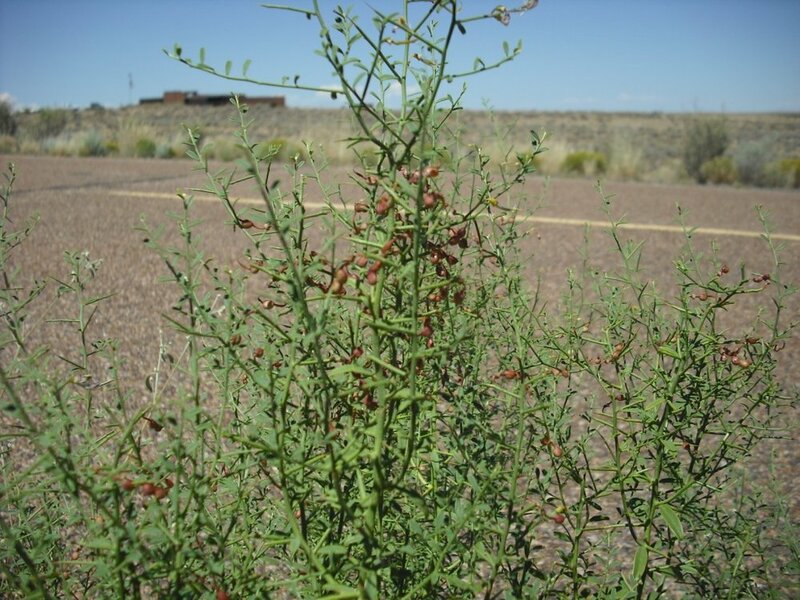 The plant has sharp spines that can cause injury to humans, pets, and livestock and are sharp enough to puncture tires. It has the ability to penetrate through concrete and pavement. Classification: Non-native. 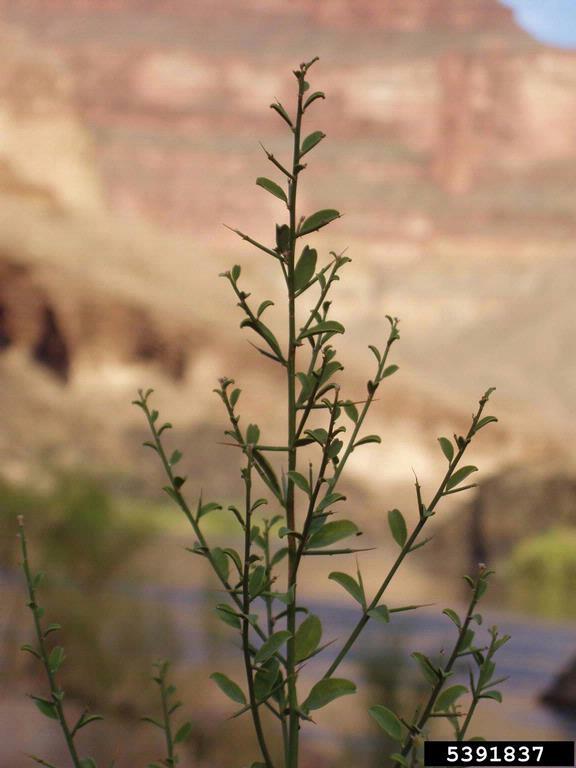 Included on the Arizona Noxious Weed List as Alhabi pseudalhagi. Botanical description: Woody and spiny perennial shrub. Leaves: Oval or wedge-shaped leaves which alternate along stems. Hairless on upper surface, hairy underneath. Stems: Spiny, intricately branched, 1 ½ to 4 feet tall. Gray-green, woody with slender spines at tips. Flowers: Small, pea-like flowers, pinkish purple to maroon that bloom from May to July. Found on spine-tipped branches on upper portion of plant. Seeds: Reddish brown to tan seed pods, constricted between the seeds and with a beaked tip. Roots: Extensive, rhizomatous woody root system growing 5 to 7 feet deep. Where it grows: Thrives in very diverse conditions including wet and dry sites. Invades roadsides, irrigation ditches, canals, and sometimes cultivated fields. 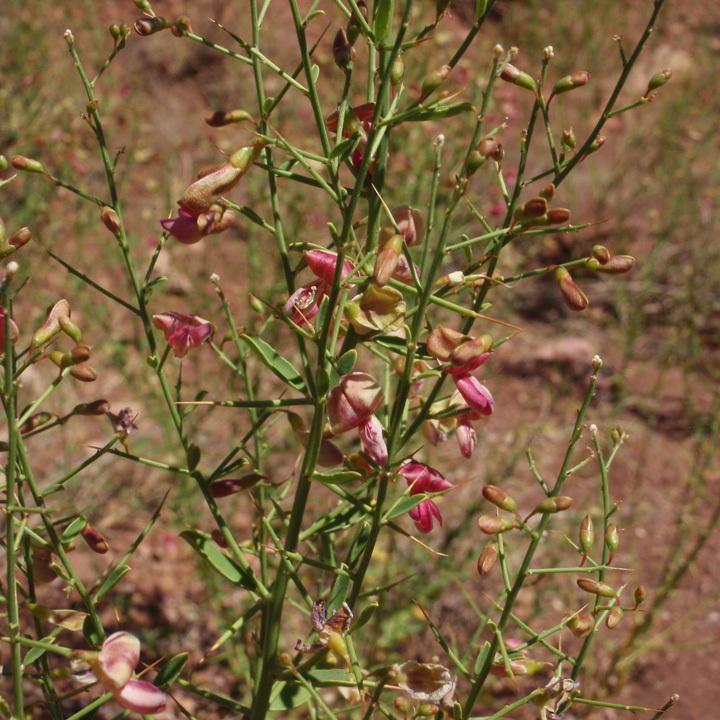 Often found in disturbed moist or dry sites. Elevation 100- 5,000 feet. Reproduction: By seed and by very deep vertical and horizontal underground roots, which send out shoots, causing plant to spread very long distances, up to 25 feet. 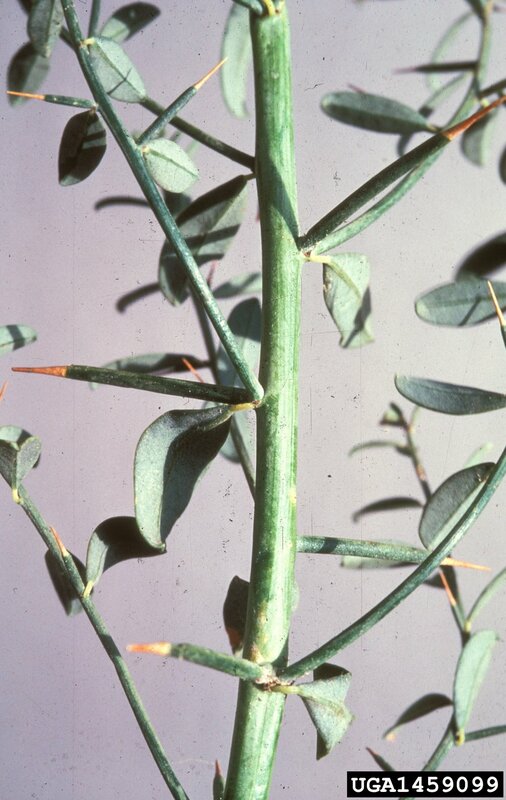 Weedy characteristics: The rhizomatous roots can produce shoots many feet from the parent plant. Mechanical controls such as digging and uprooting or tilling are not effective unless the population is very small, the work is done over many years, and all fragments are removed. Then it still might not be effective. Control strategies: Preventing camelthorn from getting established is the best control. Hand remove individual plants when the infestation is small. Chemical controls are a more effective method for actively growing plants but require frequent monitoring for new populations. They often must be applied repeatedly. Grazing, mechanical removal and burning are not very effective. Eradication of a large, established population will probably require the services of a professional. Contact your local county extension office for more information on chemical control.